Simplicity shines through with this stunning, solid 14K yellow gold cross necklace from Apples of Gold Jewelry. The cross pendant measures 6mm in width and 12mm in length, and is a perfect choice for someone looking to choose a jewelry item that is also a symbol of your faith. 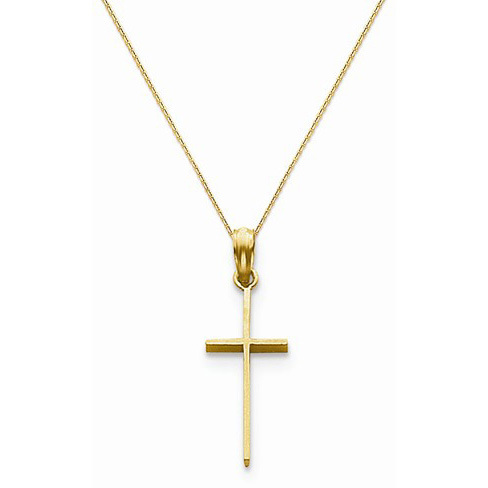 Simplistic, yet beautiful, this 14K yellow gold cross pendant also comes with an 18 inch chain, making this a great necklace choice for both men and women alike. We guarantee our Solid Cross Necklace in 14K Yellow Gold to be high quality, authentic jewelry, as described above.